As a cyclist, I was concerned when I heard of a Perth incident in which a young bike rider was run down after a car allegedly crossed to the wrong side of the road with the express intention of hitting him (pictured). I was also worried about the reported angry and destructive actions of that cyclist towards the driver moments earlier. I say that not only as a cyclist, but an educator of cyclists. I teach commuter cyclists, or those looking to become commuter cyclists, how to stay safe on city streets as the more vulnerable road users. I do not advocate more concrete barriers (aka ‘Copenhagen lanes’) or other ‘fortress’ approaches, but instead better understanding the social dynamics of the road. This enables safer navigation, and as we get better at it, we can help others adopt the same more considerate approach. In other words, road rage is itself the enemy. Thankfully the Perth cyclist was only slightly injured, for he modelled what not to do. Not just for his safety, but for that of the rest of us – cyclists, drivers and other travellers – and in more ways than might seem readily apparent. In this case, the cyclist had smashed the car’s windscreen after being affronted by something the driver had done. This is a sure fire way to heighten the aggravation of a driver, who is perhaps already distracted or agitated. In turn, it exacerbates the cyclist’s vulnerability on the road. As congestion worsens, getting around by car is an increasingly frustrating way to travel. And it is a danger that is vastly under-estimated. The World Health Organisation informs us that around 1.24 million people die on the road each year globally. Around 1200 of those fatalities occur in Australia, with about 25 times that number injured. Nearly 5000 crashes each day injure around 30,000 people each year in this country. We ask a lot of each other in car-dominated communities, to keep each other out of harm’s way. And even when we avoid crashing, we are increasingly putting our broader safety at risk. A larger and rising death toll stems from traffic related pollution each year in Australia, along with a host other concerns including community dislocation, regional and economic insecurity related to ‘peak oil’, habitat destruction and of course global warming. For the sake of direct and indirect safety, we all need less drivers and more cyclists. As WA’s Opposition Transport Spokesman, Ken Travers, put it, ‘we won’t cope if everyone drives. We need to encourage people to cycle’. But this ought not fuel self-righteousness on the part of cyclists. For more people to cycle, we need them to feel less vulnerable. Appropriate infrastructure is certainly important, but it is not the ultimate answer to our road safety needs. In the end, if the road appears to be a battleground, we further cement the tragically ill-conceived notion that to be safe we need yet more reinforced armour, notably in the form of increasingly large and sophisticated cars, and costly road separations. To escape that vicious cycle, rather than generate unexpected rage, we need to generate unexpected grace. In Melbourne last year a cyclist filmed herself being ‘car-doored’ by a man exiting a taxi on the passenger side. Thankfully, again, there was no serious injury, though there might have been. It was a thoughtless move, to be sure. But to watch the cyclist hounding the man with another brand of ‘gotcha’ self-righteousness made my heart sink. Predictably, the situation was inflamed. After the Perth incident, the driver was pictured head in hands, sunken on the path. It appeared that he was not feeling flash about himself. I hope the cyclist felt some of that too. Like the Melbourne incident, he contributed to bringing out the worst in the man. Of course, the reverse is true too. We certainly see plenty of this from drivers. But as cyclists, it matters all the more and is particularly incumbent upon us, as the more vulnerable road users, to dampen the fires of road rage, help others feel less threatened around us, and demonstrate how much safer it is to abandon our burgeoning arms race on the road and get around more gracefully by bike. Anthony James is a freelance writer and educator for social and cultural sustainability, at Swinburne University and the Understandascope. Correction made: The cyclist referred to in the 12th paragraph is female. An editor's error had text using the reflexive pronoun 'himself'. Good article. Point of clarification - the cyclist who was doored behaved reasonably. She (same incident?) was upset and confrontational, but wasn't abusive. From experience, it's very difficult to be gracious after you've just been struck while riding your bike. I take your point - but fear you are asking too much there. The Perth cyclist's behaviour though - that was less forgivable. as a regular road rider in Sydney I am appalled at the high number of drivers who pass extremely close and ignore the fact that you're even there. Generally I exercise a high level of 'Social Responsibility' with drivers and try to handle bad situations diplomatically. However, due to the high number of incidents of dangerous behaviour it is inevitable that you boil over. I can fully understand the cyclist in this case as we don't know what he has gone through prior to losing his cool. Motorists need to understand that it's not cyclists that are threatening their lives with a bike as the weapon but in fact it is the other way around. Bottom line is that if more respect was given to this cyclist, myself, and many others I know then these boil overs would be rare. Don't be too hard on this cyclist as I'm sure that he, like me, generally doesn't carry on like this. If your buttons get pushed over and over again then this kind of reaction is eventually inevitable for many cyclists. I do beg your pardon, but striking out after an act of assault (crossing the road with the intention of hitting him) is inflaming the situation?! That's tantamount to attempted murder! I was once verbally abused for riding my bike by a drunk bogan (after he made at playing chicken on the road) one Sunday afternoon, and for having returned the verbal insult, he got in his car, caught up to me and made a dangerous close pass, then did a u-turn on an isolated country road and made for me at speed. Fortunately I also did a u-turn and made it at 50km/h to the safe haven (with lots of witnesses) of a roundabout island. He yelled a murder threat at me ("Ride, MF! If I see you again In gonna kill you!") and then sodded off. Actions like this and the one you opened the piece with are not traffic infringements requiring understanding, they are criminal assaults with a 1.5t deadly weapon. If someone tried to run me down and I was on foot, no one would say that the pedestrian should be more understanding of their assailant, but put the victim on two wheels and now he's an equal player, all aggregate 80kg of him? Don't be ridiculous. The doored cyclist you're referring to was actually a girl - and she only pursued the 'gentleman' in question when he tried to go without leaving any details. I'm not sure what you realistically expected her to do under the circumstances - particularly given that there may well have been significant damage to the bike (or the rider) which was not immediately evident. I think that using this incident is inappropriate in this case. I don't recall the Perth cyclist smashing anything - especially not he windscreen which seems completely intact (photos in the linked article). I absolutely support physically separated lanes for cyclists. Many more people would cycle if there was no possibility of a car swiping them. Anthony with respect to your comments on the dooring incident in Melbourne it is a pity you didn't bother to inform yourself before commenting. For the record the "him" was a her and she followed the passenger as she was trying to get his details which is clearly evident in the video. Had the concerned male person behaved appropriately in the the first place as an act of decency let alone the law the person riding the bicycle wouldn't have to try and seek the details. Thank you for hitting me with a car door. Please sir, may I have another? Try smashing a car windscreen with your hand while riding a bicycle and report back your success, or what I suspect will be failure. The most vulnerable people on roads are pedestrians - crossing them, getting onto and alighting from trams. Cyclists are renowned for riding through red lights at pedestrian crossings, so much so that I now thank those who stop! Both cyclists and motorists often break the law and endanger life by riding or driving past stationary trams. In many parts of Europe cars, people and cyclist all use the same roads and at times no footpath to speak of with barely an incident. They are all aware of each other constantly on the look out to avoid incident. Perhaps that is where we have gone wrong-rather than segregating we should be educating all road users to respect and work together. The moment we start seperating and allowing different rights according to transport mode we create friction. While James's remark are valid, the fundamental issue here is about our national psyche. We've become a nation of 'selfies' that is driven by the notion that "every person for him/herself" is a divine creed. the old adage that driving a motorised vehicle is equivalent to driving a lethal weapon is long forgotten. I am a strong believer that all drivers should go through a thorough psychological examination before embarking on a driving course. Not everyone is fit to drive. The present driving test concentrates on one's mechanical ability, not one's attitude towards other road users. The idea that driving is fundamentally about communicating one's intention to other road users, seems lost altogether. Let's stop this senseless carnage by reviewing the issue of driving licenses. Anecdotal evidence of bad driving does nothing to eliminate the problem. Very recently, stationary at a traffic roundabout, having checked all directions, as I started to move forward a cyclist I had not seen before crossed at speed in front of my vehicle; startled, I blew the horn. I drove on but after waiting for a traffic light to change, some Km or so down the road I saw the same cyclist pedalling furiously trying to catch up with me. I stopped. His complaint was I had blown my horn. His notion, that he had done nothing wrong by in effect crashing through a poor visibility roundabout without abating speed, was to me unsustainable. What amazed me was his belief that somehow he should be thought as manifestly visible as any other vehicle, or as he said a motor bike. I have often heard people complain about the conduct of cyclists who see themselves as somehow privileged and entitled to passage ahead of vehicles and pedestrians. This is the first time I have encountered such blind and dangerous stupidity. I am glad though I stopped to field his almost breathless abuse about my involuntary blowing of the horn; he might otherwise have died of apoplexy caused by chasing me. The greatest threat to the safety of travellers on either bicycles, motor bikes or cars are, with the exception of hoons on substances, 4x4s (SUVs). People who drive these petrol guzzlers appear to believe that they enjoy a particular entitlement and that is a privileged ownership of the road. Drivers of these things, even the ones who can see above the steering wheel, invariably have difficulty seeing anything outside of their vehicles, front, side or especially back. It would be in the interests of public safety if they were banned completely. Often I am sad as I drive behind a cyclist, waiting for a safe place to pass. The cyclists are clearly nervous as they keep looking back to check whether I am going to run them down and I don't know how to reassure them that I admire anyone riding a bike and pray for their safety. Education and learning to show courtesy to the other in every aspect of life - now, there's a challenge. As Frank Fisher pointed out, paradoxically it is the cyclist's vulnerability which moulds the social dynamic and protects him/her. @Anthony James. I think you should read the article that you linked. The cyclist hit the car with his hand. The wind shield was not broken. "In this case, the cyclist had smashed the car’s windscreen after being affronted by something the driver had done." This allegation has been made a few times but there's been little evidence to support it. As stated below by others, the windscreen appears fully intact post accident. I agree with the headline and theme of this article. The real issue about road use in Australia is the lack of etiquette and politeness by all road users. The roads in Melbourne and the Bellarine Peninsula where I live are not unsafe for cyclists. Aggression and abusive behaviour by cyclists and motor vehicle drivers is immature and stupid. As a cyclist I see very few cyclists use hand signals and bells to alert other road users of their intention. I also see many motor vehicle drivers behave in a reckless and selfish manner. I believe that cyclists and motor vehicle drivers should have to satisfy a road etiquette test as part of their driver licence test. I also believe that cyclists may be more responsible if there was some form of registration and mandatory third party insurance. In my experience the best example of road etiquette was in Viet Nam; I have cycled in cities such as Ha Noi, Hue, Da Nang, Hoi An, Da Lat and Nha Trang where there is a huge number of motor bikes, cars, trucks, buses and cyclists and the etiquette for cyclists is to be aware of the traffic and give adequate hand signals and consequently, the motor bike riders and car drivers respect cyclists and slow down and allow cyclists right of way. The best road etiquette in Europe between cyclists and car drivers is in Munchen in Germany, where there is a combination of distinct cycle tracks and shared use of the road. Denmark has the best network of distinct cycle tracks and a great culture of using their bell when passing. I also see many cyclists in Melbourne who ride with ear phones attached to some electronic gadget which must affect their awareness of other road users, including pedestrians. Thanks very much for so many thoughtful comments, with many a fair point made, dilemma shared, and profound insight offered. A number of the comments have stayed with me. A wonderful gift for a writer to receive. I won't comment on the irony of the more reactionary comments, but for those wondering about where the windscreen was broken, the television reports showed the damage to be in the top corner on the passenger side, out of frame of the photo on the linked page. Best wishes to all, for safe, enjoyable and considerate travelling. The windscreen is indeed broken on the passenger-side top. The photo was framed to avoid showing it. 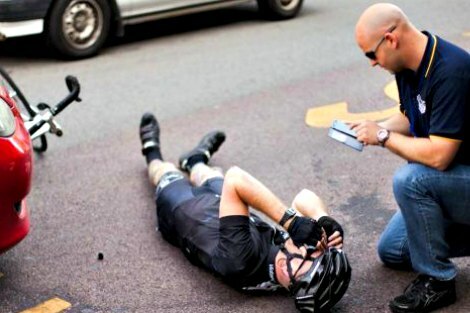 Also, the cyclist admitted in the video report made on the field, he did it and he is ready to pay for it. This is not in the article. The woman doored by the taxi passenger was trying to get the man exchange details as he was required by law to do. What would you have advised her to do otherwise, walk away? Would you? The 'film' was footage from her bike cam originally put on a bike forum then picked up by a trawling network. She did not actively seek publicity. If the passenger hadn't been a company director it would have ended there.